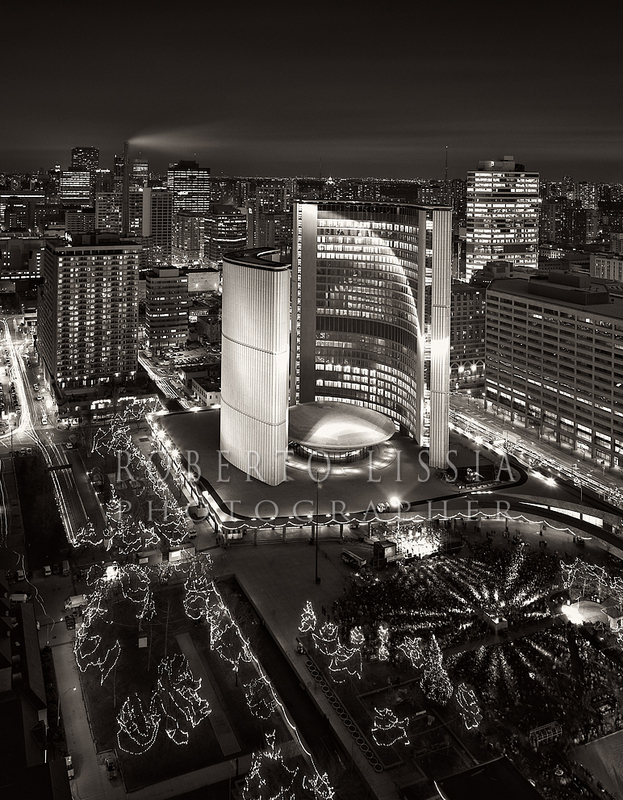 Over the years I have been photographing some of Toronto’s landmark buildings with my large format film camera. I would like to share some of the images with you in hopes that we can appreciate what we have and do our part to preserve their beauty for future generations. Above is a view of the iconic Gooderaham Building, also know as The Flatiron Building. Built in 1892 by George Gooderham & Worts Distillery, one of the largest employer in Toronto, it was their head office untill 1952. 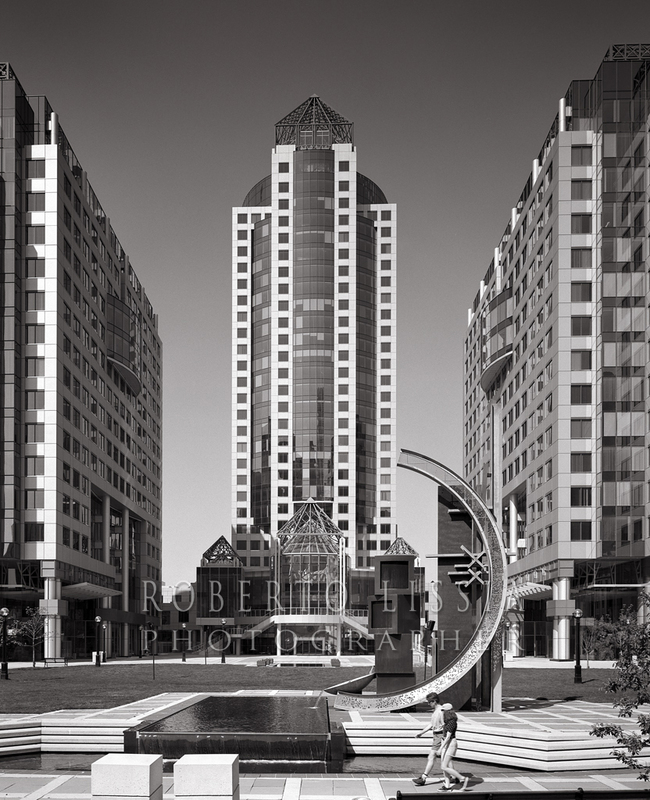 In 1911, the Commercial Realty Group purchased the building for $15.29 millions, about $797 per square foot. 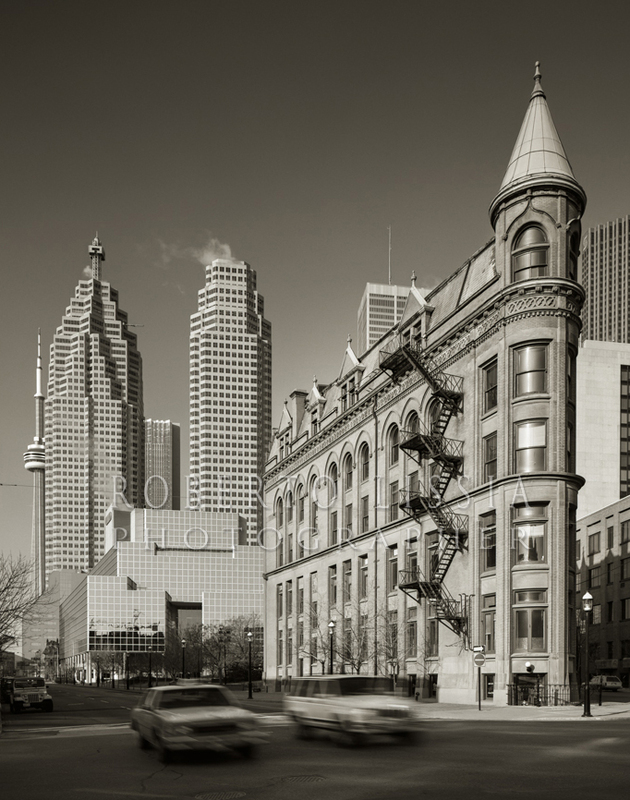 Today it is one of the few examples of Victorian and Edwardian buildings left standing in Toronto. Chapel of St. James the Less. Toronto Cabbagetown. 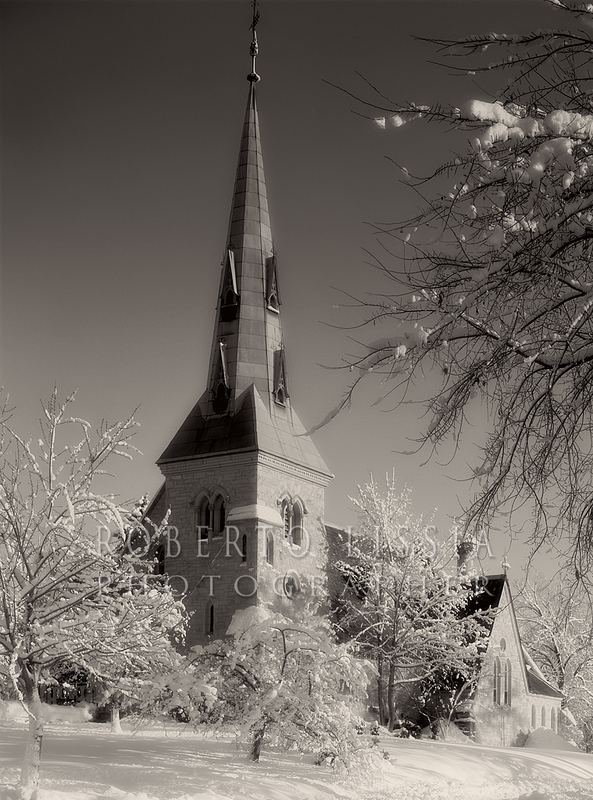 It was a bitterly cold winter day when I decided to set up my my 4×5 film camera to photograph this chapel . I wanted to capture this timeless view and preserve the sense of luminosity that the snow was providing me. I had to be fast since there was heavy clouds approaching from the east. The camera was still in the car, which was parked a few hundreds yards away. I quickly ran to grab my equipment, set up the heavy tripod, set up my old 4×5 ,composed and focused under the dark cloth, took a few meter readings and quickly snapped one shot. I was only able to capture this one exposure since a few seconds later, the dark clouds covered the sun. The day after when I developed my film, I was happy with this view and I am planning a re-shoot in colour during the fall. I’ll post a new view then. This view was captured from the Sheraton Center where a friend of mine generously invited me to celebrate the coming New Year. I wanted to photograph the New City Hall from an unusual point of view and this was the perfect chance. The lighting of the celebration provided additional depth to this photograph and a sense of happiness that, as we all know, unusually comes out of this building. 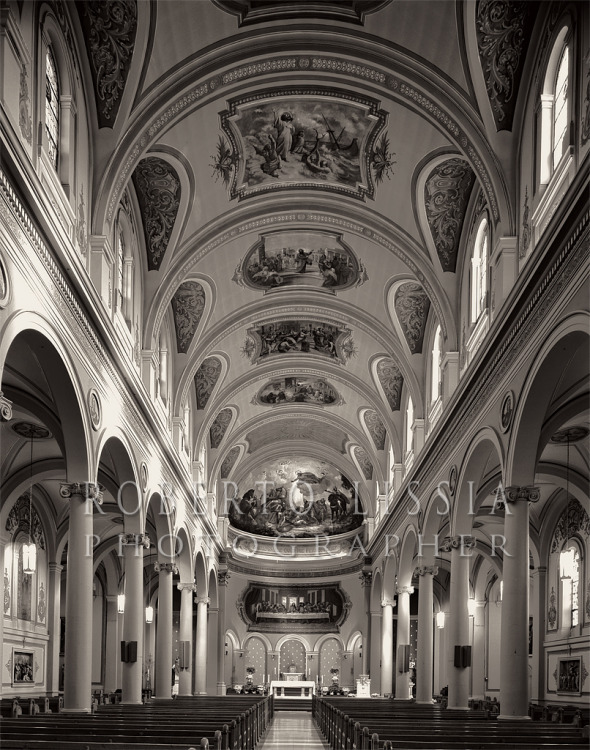 I find the interior view of this basilica more interesting and attractive than the outside structure. Viewed from Queen Street, the church is rather unremarkable but the interior is more visually attractive. The sunlight coming straight from the west seems to accentuate the depth of the nave and drive the viewer directly to the altar. A great example of Italianate style of architecture. A 27 storey Postmodern office tower standing at 200 Wellington Street West, this sleek building is the home of the Toronto municipal government. 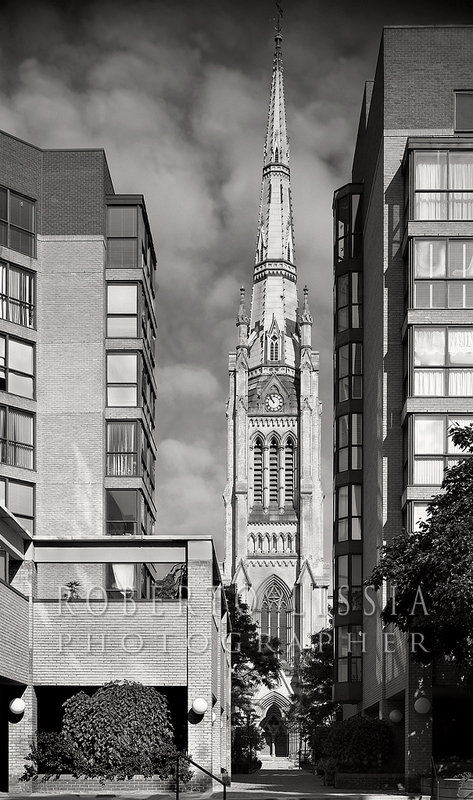 Located at 65 Church Street, St James Cathedral is home of the oldest congregation in the city. Designated as an Ontario Heritage Property, is a beautiful example of Gothic revival, standing in the heart of what used to be the Town of York, now Toronto. The present version of the church was completed in 1874, replacing several wooden versions that did not survive the rage of the fire. 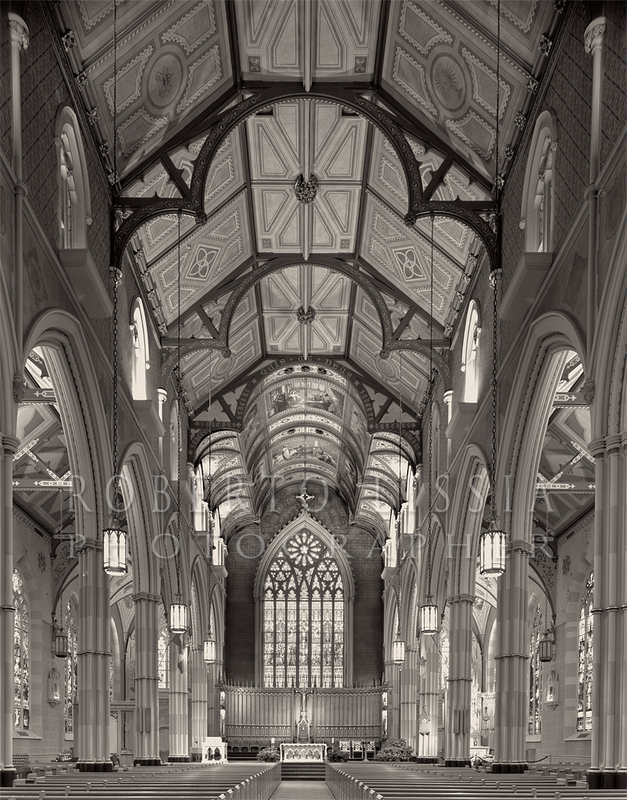 The interior of the cathedral is illuminated by large stained glass windows on both sides of the pews, creating a beautiful soft light throughout the church. All the details of the structural elements such as the exposed rafters of the roofs and the broad tie-beams are clearly visible in natural light enhancing all the decorative elements.